SHENZHEN, China – Research and economic development in agriculture will be advanced thanks to a memorandum of understanding signed today between Washington State University and BGI, one of the world’s largest genomics companies. 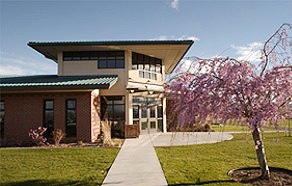 RICHLAND, Wash. – Washington State University Tri-Cities is partnering with Canada-based VanWest College to develop a nationally accredited English language learning program that will benefit international students and the local community. SEATTLE – Imagine a material that allows us to construct new buildings more quickly. Helps to combat climate change. Supports restoration of our forests while also helping revive our local rural economies. PULLMAN, Wash. – Officials from Bellevue College and Washington State University have signed a memorandum of understanding allowing further discussions about a possible partnership. TOPPENISH, Wash. – A new partnership between Heritage University and Washington State University Tri-Cities will allow students to chart a path to an engineering degree while staying close to home in the Yakima Valley.